I finally decided to put Debian Testing on my Acer Aspire One A110-Aw. I want my Acer Aspire to work the way I want it to. 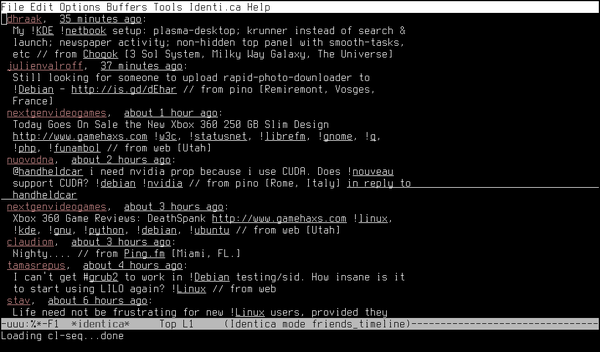 Although the Linpus distro is surely workable, in the end it was to much a burden to me. The ugly and hard to comprehend start up scripts from the Linpus distro got in my way too much. This is why I choose to change the distro. 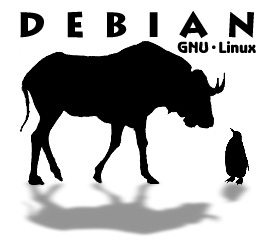 For me both Slackware as Debian are good options for a netbook. I decided to go for Debian. Debian gives me full control and comes with a huge repository. I kept the number of deamons small and left out HAL. The Acer Aspire One A110-Aw still boots very fast. Update: It seems that newer versions of Xorg (at least in Debian) need hal. So I had to put hal back in /etc/rc2.d. I installed a 2.6.28 kernel, with the help of this webpage: Gentoo on Acer Aspire One A110L. . With this kernel the wireless chip works out ot the box. I edited /etc/network/interfaces so my AA1 connects immediately at boottime with my access point. (I use the AA1 mostly at home. One of the reasons to buy this Aspire was that it comes with a solid state disk (SSD). In order to save the life of the SSD, I make use of ramdisks. This is done by mounting them onto tmpfs. I run my home directory in ramdisk. This to keep the number of writes to the SSD low. I am already used to live in ramdisk because of my silent discless workstation. I mount my homedir in tmpfs. Keeping home in tmpfs helps the discipline to truly use the AA1 as a netbook (Disziplin Muszt Sein). Here is a small list of the applications I put in the AA1. Well, some of them. I started with Debian Testing with only the "standard" selection. And added X, cvs, and other stuff from there. I keep the number of applications low. 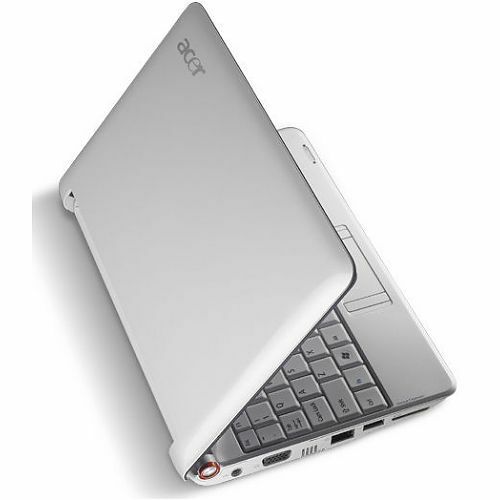 I want to use the Aspire truly as a netbook. So I don't want any data on it. Bitlbee is the gateway between IM (for the youngsters: that is stuff like MSN) on the web and a IRC-client (like ScrollZ) on your desktop. It rocks! Elinks is a great text mode tabbed webbrowser. Htop offers a bit more then top. GNU Screen is really awesome. If you don't know it or use it, you now know what you absolutely have to spend your next weekend on. Learn to start, attach and detach and learn a few keystrokes. You will never regret it! mutt is a great email client. I use it as a imap mailclient. ScrollZ is a great textmode IRC-client. It looks a lot like BitchX and Irssi. However, ScrollZ comes loaded with built-in functions and does not require Perl. So if you want a good IRC-client that is not bloated and is in the Debian repository, look no longer. See also my MSN and ScrollZ page. Vim is an enhanced version of vi. It tries to be as bloated as emacs but hasn't won this race yet. Emacs is operating system on its own. I run identica-mode in it. This provides a nice text mode interface to Identi.ca, the Twitter-alternative for Open Source enthousiasts. It has a slightly better sound-to-noise-ratio too. Mplayer is a movie player. Ratpoison is the most efficient windowmanager in the world. It's main mission is to reduce the usage of that wristkilling mouse. The keybindings of ratpoison are inspired by those of GNU Screen. This makes the transition to ratpoison smooth and keeps the learningcurve short. My latest discoveery. Blame Axel for it. Vimperator makes firefox behave like vim. I have been using vimperator now for some time and have banned all other graphical browsers. Even better then vimperator, because vimprobable is a browser on it's own, not a plugin on firefox. Xpdf is a pdf viewer that doen't come with a ton of dependecies. Update: Currently I am using vimprobable as graphical webbrowser. After an apt-get update && apt-get upgrade, I got some problems with X. It turned out that hal needs to be running (see section above about /etc/rc2d). Also tapping on the touchpad stopped simulating a left mouse click. On http://wiki.debian.org/DebianAcerOne this is reported also. Adding the following lines in /etc/X11/xorg.conf in the section Section "InputDevice" Identifier "Mouse0" resolved this.